Georg Friedrich Haas's new opera, Morgen und Abend, is a relentless sensory assault over 90 wailing, gnashing minutes (a barrage of shrieking, decaying violins and thunderous percussion). In its world premiere at the Royal Opera House, directed by Graham Vick, fisherman Johannes struggles "into and out of life". German baritone Christoph Pohl delivers a committed performance as the aged and bewildered fisherman, wandering through an eerie, colourless Limbo, haunted by those he has loved and lost. The colourless, hostile plane between life and death is a convincing and compelling creation. Chalk white furniture rotates supernaturally and almost unnoticed on a revolving circle in front of an oppressive grey wall, flooded with a piercing white light. 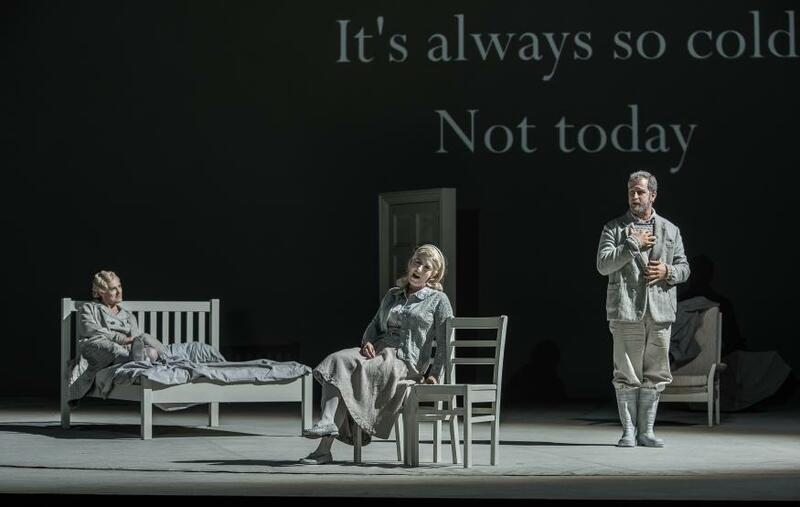 The sparing and simplistic English libretto, translated from Norwegian writer Jon Fosse's original libretto by Damion Searls, is painted across the backdrop as a breathing, floating text. Academy Award nominee Klaus Maria Brandauer is rather stagy as Johannes's father Olai, who delivers a prolonged, repetitive monologue as he waits for Johannes to be born. When the birth is announced there's another drawn out discussion in which the same questions and assurances are batted back and forth on loop between Brandauer and midwife Sarah Wegener, who is competent in this initial role before returning as Johannes's daughter Signe. As Signe, she is the most authentic and moving character we encounter; discordant, mournful and distant at first, and finally gasping out her grief in a hoarse, poignant whistle. Seasoned Dutch contralto Helena Rasker brings a rich, ethereal sensuality to Johannes's dead wife Erna, but while the relationship between Johannes and the ghostly apparition of his best friend Peter is touching and convincing in its everyday intimacy, Will Hartmann as Peter is the weakest of the ensemble, occasionally strained and cracked. Ultimately, Morgen und Abend (which is German for Morning and Evening, if you didn't know) doesn't offer a profound reimagining of what happens when we die, instead reaffirming popular notions of what it may entail. Those looking for an uplifting and lyrical portrayal of the human journey won't find it here; we are sent on our way with a deeply unsettling reminder of how brief, unremarkable and violent that journey can be. Morgen und Abend is at The Royal Opera House, Covent Garden, on 17, 21, 25 and 28 November. Tickets £5-£85. Londonist attended on a complimentary press ticket.